Summer is actually a great time to visit Texas, especially if you’re a fan of warmer temperatures like I am. Any visit to the Lone Star State though should start with Dallas, a cosmopolitan city that weaves in modern elegance with Texan charm seamlessly. Working with The Ritz-Carlton, I spent a few days exploring the city as a tourist and not for work, which was a first for me. What I discovered was a fun city made all the more enjoyable by the incredibly gracious Ladies and Gentlemen of The Ritz-Carlton, Dallas. This is one city that certainly was never on my radar of top places to visit. But then I found myself there for a couple of days and decided to make the most of it. What I discovered was a city with a lot to offer and one in which I had a great experience. Staying at The Ritz-Carlton, Dallas I ate some great food and visited popular sights like the Reunion Tower GeO-Deck and George W. Bush Presidential Library & Museum, but it was a visit to a very special museum that I enjoyed the most. The Sixth Floor Museum is located in the very building where Lee Harvey Oswald fired those far too impactful bullets (formerly the Texas School Book Depository) and the museum tells the story of the JFK assassination expertly. Using photos, film, narration and interactive displays, this thorough and very well researched museum takes guests through the turbulent era of the early 1960s, the events that led to the President’s assassination and ultimately the murder itself, along with the impact Kennedy’s death had on the world. Standing there in the same position as Oswald once stood, looking out across at Dealey Plaza was an eerie feeling, it brought the event to life in a way that has always been hard for me, since I wasn’t alive in 1963. I can’t recommend this museum strongly enough, it really is just that good. Dallas is big, really big (home to more than 1.3 million people) and because of its size knowing which neighborhoods to visit and stay in is crucial. The Ritz-Carlton, Dallas couldn’t be in a better part of town, calling the posh Uptown District home. One of the most pedestrian-friendly areas not only in Dallas, but anywhere in Texas, it’s a newer community full of great restaurants, amazing shops and lots of people out and about either enjoying the cafes or the many activities found nearby. Before I arrived I was a little worried that its location wouldn’t be the best for my sightseeing goals, but I couldn’t have been more wrong. Everything I wanted to see and do was a very short and easy Uber ride away, meaning I could enjoy the best sights in Dallas while staying at the best hotel in Dallas; a true winning combination. Before visiting Dallas, my knowledge of the Texas food culture was based largely on stereotypes, which is one reason of many why I was excited for some help in discovering what it really means to eat like a Texan. Thankfully, the fine folks at The Ritz-Carlton, Dallas make it easy whether you’re a newbie like me, or a true Texas food aficionado. The hallmark of any great luxury hotel I think is how well they bring the local culture inside their doors and share these experiences with guests. Most properties in The Ritz-Carlton family feature afternoon food or drink presentations as a complimentary added-bonus to guests, but at The Ritz-Carlton, Dallas they offer something truly unique. The first hotel in the world to feature a professional Guacamologist™, every day at 6pm sharp guests (and locals) congregate in the lobby to watch the master chef whip up what is thought to be the best guacamole in the state, if not the country, entirely from scratch from the freshest of local ingredients. 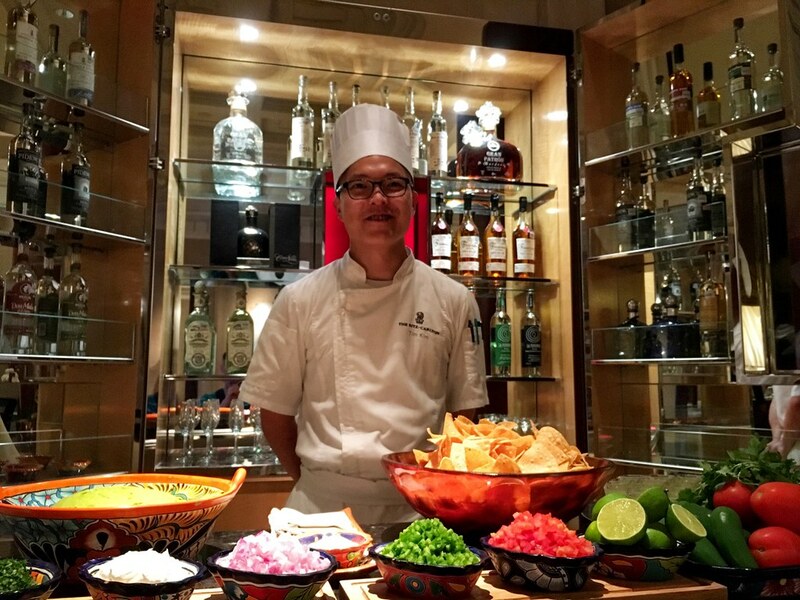 Next to the chef is an incredible tequila vault and servers share the differences between each iconic brand, while mixing up batches of mini-margaritas to accompany the expertly crafted guacamole. It’s one of the most interesting and just plain fun presentations I’ve seen at any hotel in the world and the fact that it’s a complimentary service offered every day of the year is simply amazing. But that’s not where the local culinary highlights of Dallas in the hotel end, as I learned over a delicious lunch at the hotel’s signature restaurant Fearing’s. 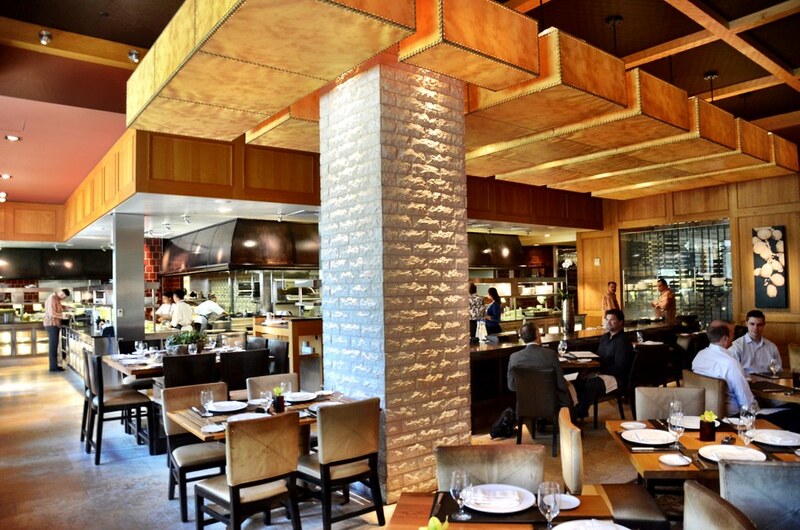 Celebrity chef and author of the Texas Food Bible, Dean Fearing is a Texas institution and his acclaimed restaurant at The Ritz-Carlton, Dallas is routinely named as the best in town. The layout of the restaurant itself is what intrigued me first, there are seven stylish dining venues within the restaurant, offering the perfect atmosphere to fit your mood, whatever it may be. While it’s a globally inspired menu, there’s no doubt that it has Texas roots, as evidenced by the courses I enjoyed over a long lunch. Starting out with a classic Tortilla Soup, this is the perfect introduction to the complex flavors of Tex-Mex food whether it’s your first time enjoying it, or if you’re a local. The most unique aspect of my delicious meal though was the Dr. Pepper braised short ribs. As you may or may not know, Dr. Pepper first started in Waco, Texas and while many restaurants pay homage to the local soda, I can’t believe there’s anything better tasting or as refined as this dish. I also have a fierce sweet tooth and while part of me wanted to sample everything on the menu, I was immediately drawn to another locally inspired classic – banana pudding with homemade vanilla wafers. This isn’t your average Turkey Day dessert though, as with all of Fearing’s dishes, this too has been reimagined and when served with fresh (and still hot) beignets, it’s one of the best desserts I’ve enjoyed in a long time. It shouldn’t come as a surprise that in a city that does everything to the fullest, that The Ritz-Carlton, Dallas delivers on every level. 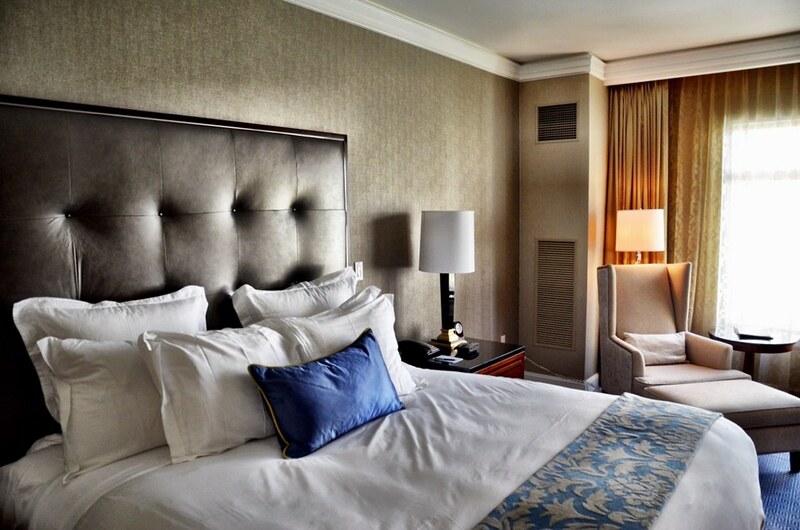 There’s no such thing as a bad property in The Ritz-Carlton family, but this one is different. Whether it’s the perfectly polished finishings, the incredibly hospitable front of house staff or the expansive flower display (changed weekly), it all just works and it all signaled that this is not your average luxury hotel. That feeling persists throughout the property, from the refined but dangerously comfortable guest rooms to the Club Level Lounge, where once again Texas flair can be found on proud display. The hotel manages all of this without being cold or stuffy, which is something I personally appreciate. As a great example, in the Club Level Lounge you’ll find everything you would expect, from the many food presentations offered throughout the day to amazing wine options. But there’s also a candy bar; a whimsical addition that signals the folks at the hotel don’t take themselves too seriously. I love that, I love the personality it effuses and it instantly made me connect with the hotel in a way I hadn’t previously. Whether it’s the margarita salt scrub service offered at the spa, or that daily guacamole ritual, my second time visiting Dallas truly felt as if I experienced the best that the city has to offer. This isn’t a bland or corporate hotel, this is a fun and immersive experience that provides the stellar service and quality one expects from any The Ritz-Carlton hotel, but with warm Texas hospitality and that unique Dallas sense of style that has made the city so very famous around the world. Add in amazing food and an upscale location, and I know that from now on The Ritz-Carlton, Dallas absolutely will be my go-to hotel whenever I find myself in the Big D.